Is Rat Damage Covered By Car Insurance? If you’re a car owner, you’ve probably imagined worst-case scenarios involving collisions with other vehicles on the road, bad weather, vandalism, or a break-in. But you may not have considered the considerable damage that can be caused by tiny crawling creatures. 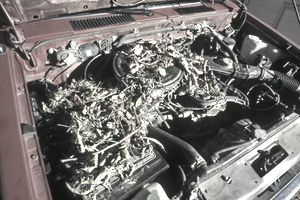 From chewing on essential wiring to building nests and hiding pounds and pounds of food inside your engine, rats and other rodents can cause an incredible amount of damage to your vehicle — and headaches to you. Why do rodents see your car as an ideal home? Under your engine, it’s dark and warm — and the dog food and other tasty things stowed near your car in the garage make for quite the rodent feast. In the winter, your vehicle insulates critters from the cold and from predators for whom they’d make a tasty snack. The biggest concern from rodents is the wiring issues the can cause, which can be particularly tricky for a mechanic to fix. Rodents generally chew on wires close to where they’ve built a nest inside your vehicle, which could be in a difficult to find and reach area. Those nests themselves are also an issue — some mechanics have reported finding as much as 25 lbs of dog food and hair inside an engine, choking it up in the process. The diseases and bacteria rodents carry are also worrisome: if rodents have built a nest near your air filter, every time you crank up the air, you’ll get a fresh blast of rat poop and dander. "That has to be an ideal way to spread an airborne virus," Brian Amman, a disease ecologist with the Centers for Disease Control and Prevention, told Popular Mechanic magazine. Are the Damages Covered By My Auto Insurance Policy? The damage rodents cause to your vehicle can be very expensive. If you have had the foresight to purchase comprehensive coverage on your vehicle, you might be in luck: depending on the specific terms of your auto insurance policy, the damages may be covered. Though comprehensive coverage, which covers non-collision damages to your vehicle, is usually not required by your state, if you lease your car or took out a loan to pay for it, you may be required to carry it — which for those of you caught with rodents in your car is a very good thing! But before any damage happens, make sure to understand what is and isn’t covered by your policy. Read over the terms carefully and contact your insurance agent if you have any questions. If the amount of damages is expected to be more than the cost of your deductible, you might want to file a claim. If not, it might be better just to pay for the damages yourself to avoid increasing your insurance premiums. If My Car Is Parked Inside, Won’t My Homeowner’s Insurance Cover the Damage? Definitely not! And it’s unlikely that the policy would cover damage from rodents inside your house either. Rat Damage Is Covered By My Insurance — Phew. What Do I Do Next? If you’ve found out that rodents have damaged your vehicle but also have a comprehensive policy that covers the damage, you’re in luck. The first thing you need to do is document all of the damage. Take photos of your vehicle that clearly depict any visible damage the rodents have caused. Contact your insurance agent as soon as possible with as much information as you have and to get the claims process started. The insurance company will then either send a claims adjustor to your home or have you drive to a pre-approved auto body repair shop to inspect the vehicle. After your claim has been processed and approved, you will be issued a check for the cost of repairs or an approved mechanic will perform the necessary repairs. If your claim is denied, contact your insurance agent or a trusted attorney. If you have a comprehensive policy with a very high deductible and your vehicle is still drivable, it might be a good idea to take your car to a trusted mechanic for a quote on the repairs. If the cost of fixing your vehicle will be less than the deductible on your policy, it may be best to just bite the bullet and pay for the damages out of pocket. If you’ve just paid for costly repairs caused by rats or other critters, you’re probably not eager to shell out a ton of cash to fix more rat damage anytime soon. However, if you don’t take common-sense steps to rodent-proof your vehicle and/or garage, you’re likely to have an unpleasant case of deja-vu. Dog food is delicious for dogs — and a rare delicious treat for rodents. Any pet food or birdseed, if not locked up in smell-proof and tamper-proof containers, could end up squirreled away inside of your engine, air cleaner, or glove box by rodents or other creatures. Would you head into the pouring rain without an umbrella or raincoat and then complain that you’re getting wet? Parking your vehicle in an area with a rodent problem, in a forest, or in an area with tall grass would be just as foolhardy. If you’re parking outside, stick to paved areas — or gravel roads, if you must. Have mouse holes in your garage? Seal them up. Storing your plants inside your garage for the winter? Make sure they’re rodent-free. Have unruly hedges just outside? Trim them. Block any entrances to the engine with wire screen or by placing traps on top of wheels in the offseason (speak to a mechanic in order to do it properly!). Though it’s a bit more costly, wrapping your car’s wiring in rat-proof tape is also a really good idea. If you can and it’s safe to do so, leave your car’s hood up when it’s parked in the garage — remember that creepy crawlers love nesting in dark, cozy places. Some people also swear by spraying peppermint oil, pepper, the urine of predators, or rodent deterrent sprays inside, or installing an electronic rat repellent device that emits a noise very annoying to rodents that humans can’t hear. It’s simple, but it works: old fashioned snap traps are your best bet for catching pesky critters. Live traps and glue traps are not recommended as the animal will panic and quite possibly spread disease by defecating or biting, and prolong the animal’s suffering (and yours!). If you have pets, poisonous bait is not a good idea because it could also poison them. If you’re “lucky” enough to catch a rodent, make sure to be careful with its disposal: mix a 10 percent bleach solution and spray down the trap — then make sure to wear gloves when you pick it up!